It’s a new month, so it’s time for a new release from Shawnimals “Ninja of the Month” series. This month the company has released their newest addition, Action Ninja! 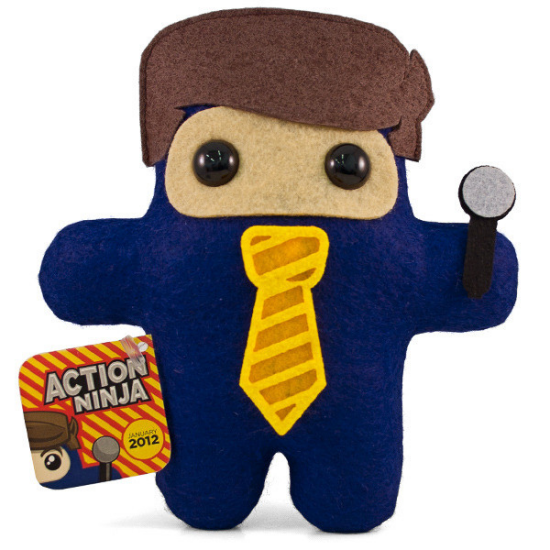 This plush is 7x7in and comes with a clip-on microphone, neck tie, and an “anchorman” hairdo along with the usual matching pin and sticker. Like other Ninja of the Month plushes, Action Ninja is limited to 100 signed and numbered pieces. This toy will be available on January 11, 2012, on the Shawnimals website and will cost $30.00 USD.